After the Cincy CX weekend, I had conveniently planned to visit some of my clients around the state of Ohio. My driving tour included stops in Columbus, Dayton, Toledo, and Cleveland before the cross-state trek back down to Kentucky. 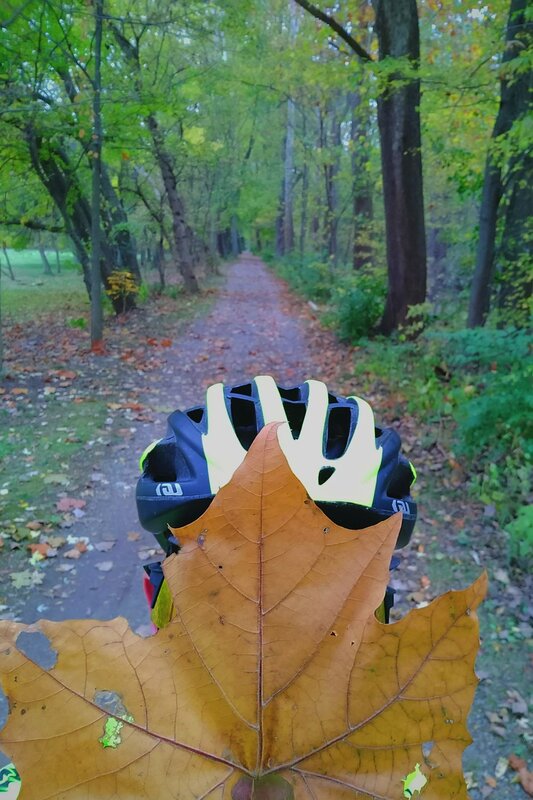 From what I could tell, the state of Ohio has some wonderful bike infrastructure, with wonderful bike paths and lots of beautiful places to ride. It was nice to enjoy the fall colors and cooler weather! More importantly though, I got to see all of my Cleveland family and enjoy some quality time with them. That put me in the best mood going into the weekend of racing. While I have been to Louisville on roadtrips and for the 2016 Amatuer Road Nationals, the 2017 Derby City Cup and Pan-Am Championships was my first cyclocross trip to the city. 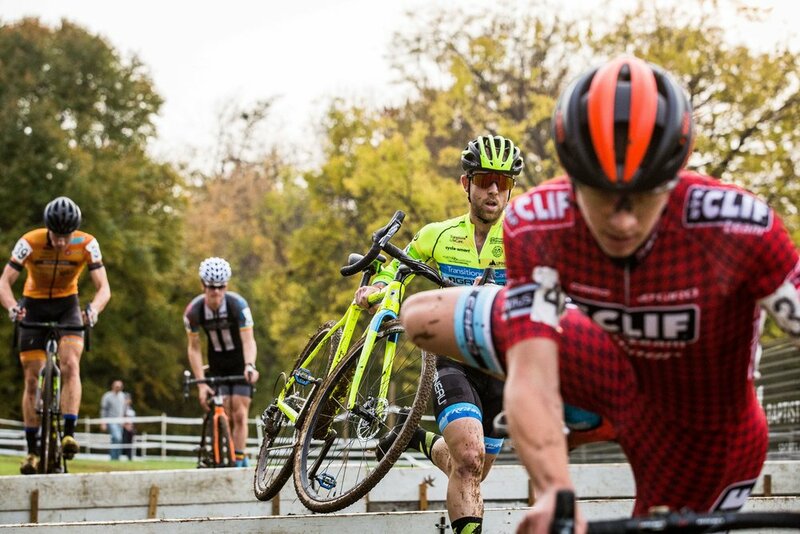 Those more familiar with the sport will know that Eva Bandman Park along the banks of the Ohio River in Louisville was the site of the 2013 Cyclocross World Championships. 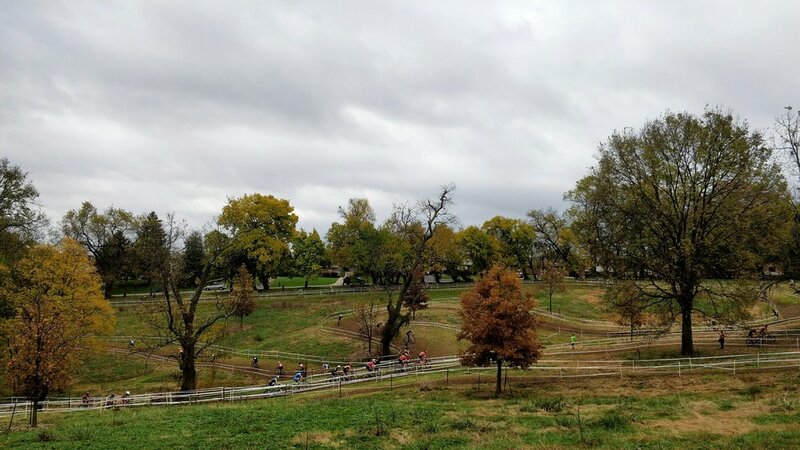 And even though the same venue had been used for the Derby City Cup since, this year’s edition brought a change in venue and an opportunity to check out the course for the 2018 Cyclocross Nationals (part 2). Joe Creason Park is south of downtown Louisville, very near the Bellarmine University campus and directly across from the Louisville Zoo. Known as a tennis facility, the park itself offers some hilly terrain as well that gave a similar feeling to the Devou course of the prior weekend. Like a good racer, I showed up with my Cleveland family in the aptly named “Deathstar” Sprinter van. After the tents were set up and a short road ride to Cherokee Park, we rolled a couple laps of the muddy course. Thursday rain storms left their mark on the course as riders were slipping and sliding around the track during pre-ride. The aforementioned hills provided some unnerving moments on the bike, and the steep uphill slogs required you to come prepared with a box full of matches ready to burn. The conditions on Saturday improved as the day progressed. I am fortunate that I didn’t have to race in the early AM hours. Even though the course was drier by the time I hopped on course around 1p, there was still plenty of bike washing required. I was able to get in a good warm up and felt comfortable with the course and the lines I would take beforehand. Mentally prepared, I headed to the start with high hopes that today would be a good day. I found myself on the grid next to my friend Jake Lasley (Team Soundpony). We chatted about how having UCI points was a nice guarantee you wouldn’t be at the very back, but as I turned my head to check, we were still pretty much last row of the grid. The field was stacked with all the top riders from around the continent. My one UCI point was enough to put me on the fifth row… of six. With so many riders jockeying for position and a demanding course, the race would be about control and patience. Sure enough, the start was hectic with riders bumping, rubbing, and chopping their way through in the field of 60+ riders. I was patient off the line – maybe too conservative – and let the over-eager riders in the bunch go all in off the line. The ground was still slick in some spots and riders hit the deck as we navigated some of the off-camber turns and fast descents. I found myself in a good group and continued to move forward with them as we pedaled hard towards the completion of lap one. My friend/mentor Brent Evans had told me to go all-in on the long climb to pit two. As the race went on, I continued to push myself each time up the hill, reeling in riders every lap. I was really proud of the lines that I was taking but my engine on the day wasn’t something I was particularly thrilled with. 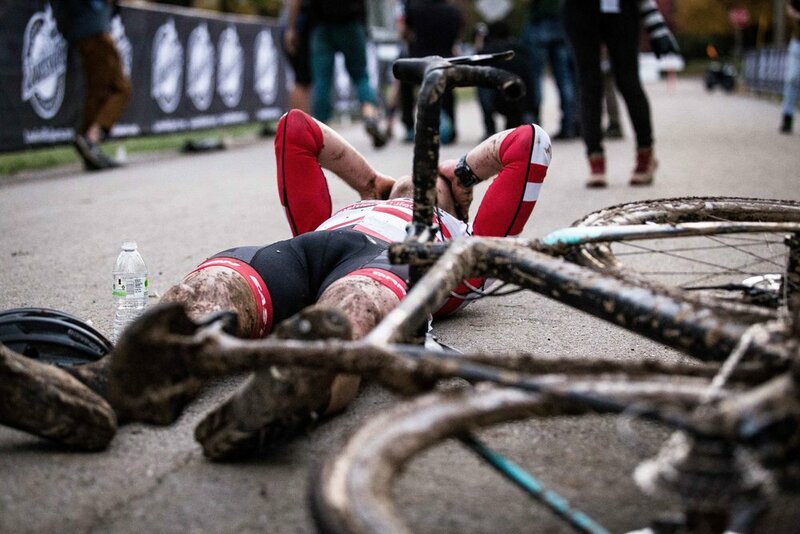 It wasn’t long before I grew tired and my form became sloppy in the technical sections of the course. I carried on and eventually came around after a two-lap “recovery” period. However my rally didn’t come soon enough, and I was unceremoniously pulled from the race before the leaders could catch me with one lap to go. While unsurprising, I was still disappointed to be pulled from the race. I know that the field was deep with strong riders, but I still expect a lot from myself as an athlete and as a person. Fortunately for me, there was another race and another opportunity to go better than the day before. After washing bikes and cleaning up camp, we rolled back to our host house who had cooked an AMAZING dinner for our team! I'll say this a million times, host housing is really the backbone of cyclocross here in North America. Without the help of strangers around the country, many of us would not be able to afford the cost of travel associated with racing a full UCI schedule. It was really a lovely time getting to know some new friends in the Louisville area and a great way to cap off Saturday! After Saturday's ride I was ready to race on Sunday at the Pan-American Championships. The course remained mostly unchanged from the day before save for a few corners here and there. And with no over night rain, the track offered perfect conditions of grip and ruts. I arrived to the course early to watch the early categories and just hang out to watch friends race. Unfortunately for these early warriors, the course was still wet and slippery, but it was awesome to see everyone battling the hand they were dealt. 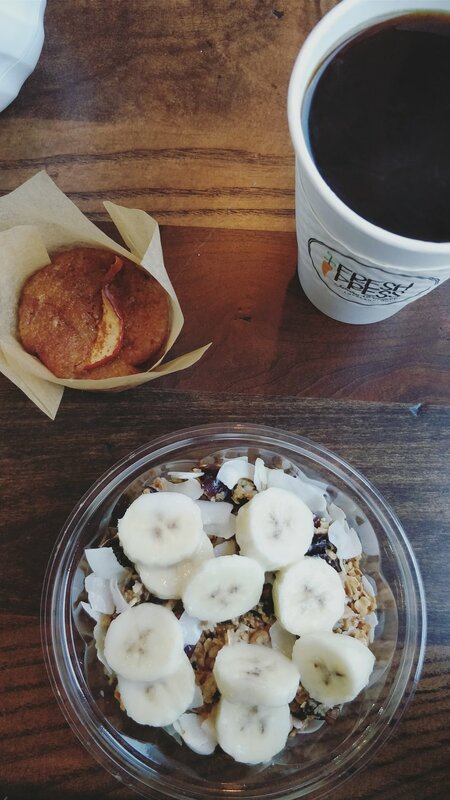 I went through my pre-race routine: snack, pin numbers, pre-ride, lunch, last recon lap, warm up, and get focused. As I rolled to the line I felt more calm than anything. I knew the course, I knew the lines, and I knew the race was going to be fast from the get go. With the Junior and U23 Men racing in separate categories, the field was a bit smaller than Saturday and, as a result, I was closer to the front, taking a spot in line behind Stephen Hyde (Cannondale p/b Cyclocrossworld.com) and Allen Krughoff (Krughoff Racing). The whistle blew and I had the worst start I've had all season. I missed my pedal and was slow to get on the gas as the peloton barreled down the start straight for the first left hand corner. At this point, I was shuffled to the back of the bunch, the lanterne rouge, if you will. Yea, I was planning to be a bit patient in the first lap, but my intent was to hold my spot in the top 25 and be patient. Now I was on the back foot with all the work ahead of me. I pushed my way through a few spots in the opening lap. I'm sure that I lost more friends than I won in that first lap, but as we all know... "There are no friends in bike racing." With no need to worry about my in-race reputation, I moved (and maybe chopped) my way up inch by inch. At the conclusion of the first lap, I was not the last person in the race, but I was far from the front. Just like Saturday the challenging nature of the course had broken up the race into small groups. I distinctly remember looking over across the course on lap two or three and seeing my teammate Michael van den Ham leading the race. For those following along, it was not me at the front of the race like many thought on Saturday. But Michael was taking it to the best racers on the continent and showing no fear as he did! 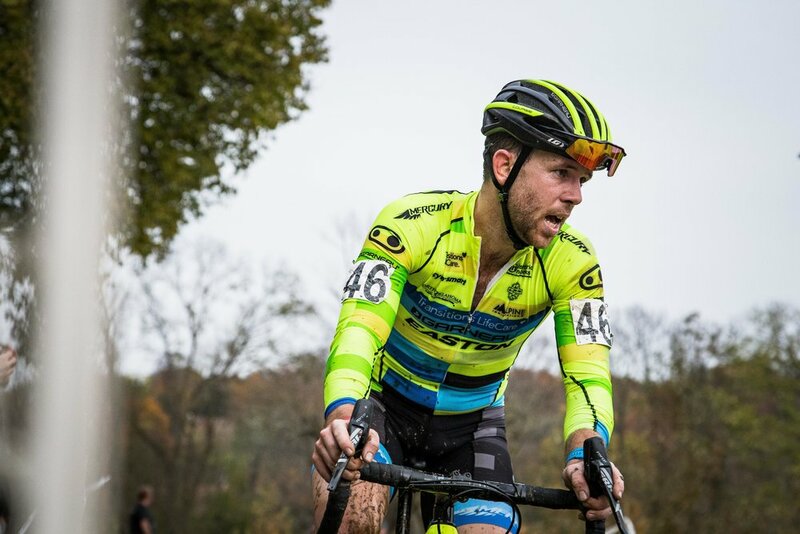 A bit further down, I had made contact with my other teammate, Dylan Postier, and we started to ride together in pursuit of the others in front of us. Try as I may to continue pushing on at a strong pace, my legs and handling started to fail me as the race wore on. I could tell my form was deteriorating as I started to grab my brakes more and my handling got less fluid and more static. It came to the point where the gaps I was creating to Dylan with my errors became too much to close and I was left to ride solo. I continued to push my legs as hard as they would go, which didn't feel very fast at all. I didn't know where I was in the field, but my mind waffled between hope that the referees would end my suffering and determination to keep going to make the lead lap. On what would be my final lap, my teammate Anya, who had been cheering all race, asked, "Are you tired yet?" There must have been enough energy in my system to muster the death glare that I shot her in the moment, but that would be all that was left - after the race it was a good laugh though, I promise! As I rounded the corner, the officials had seen enough of me and directed me off the course. Congratulations on a great ride MvdH! As the morning broke on Sunday, I was hopeful that I would be able to muster the courage and the legs to have a solid ride. 19th in the Continental Championships isn't bad and it is a result of continued improvement. But to call it satisfying would be a lie. There have been many times where I find myself hoping for faster progress, for "THE big result" that I know I'm capable of and that which I want so badly. It can be exhausting to continually worry about that and I think the constant worrying got to me during this trip to Ohio. But as I write this, I am reminded by the many quotes and reminder scrawled on my bedroom's chalkboard to cultivate positivity. While the numerical results leave plenty to be desired, there are many positive takeaways from this block of racing. The legs have been good, my handling is improved compared to years past, and my results against the best riders on the continent are improving. True progress is slow but sure. The pieces are in place and there will be a time when those pieces finally come together. But until then, we can only continue to do the little things right and steadfastly remember "Something good is about to happen." Next up is the one-day Cyntergy Hurtland race in Tulsa, OK on Sunday, then it is on to Indianapolis for the Major Taylor Cross Cup.